3.5 DAY OPEN PARTY 3-25-19 PM / 3-29-19 AM $1950.00 Per Person INCLUDES: Meals, tackle, non-alcoholic beverages, fish processing (limited) to 50lb fillets vacuumed packed per person, and a rod & reel combo. NOT INCLUDED: Mexican permits, alcoholic beverages, & gratuities. 1Available Spot $1,950.00 Departs: 1-21-19 PM Returns: 1-25-19 AM CALL!!! 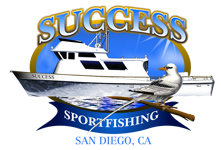 The Success will be operating fishing, spearfishing, and surfing trips at the following locations. We will be in San Diego, Mag Bay, Puerto Vallarta and La Paz. Please check our fish reports to stay up to date with the current fishing conditions.